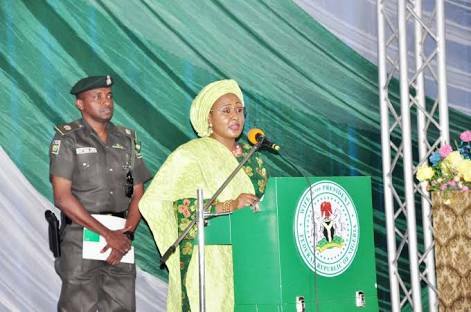 The State Security Service has confirmed that it is in custody of the Aide De Camp (ADC) to the wife of the president, Aisha Buhari. The secret police disclosed that Sani Baba-Inna, a chief superintendent of police (CSP), is undergoing interrogation. PT had reported Monday how Mrs Buhari petitioned the police alleging her ADC defrauded her of N2.5 billion. Following the petition, the Police, last Friday, arrested Mr Baba-Inna and raided his home in the Garki District of Abuja. However, the outcome of the raid and checks on his bank account showed that money of such magnitude was not in those locations. Not satisfied, Mrs Buhari asked the SSS to take over the investigation. The spokesperson of the service, Peter Afunanya, had told Premium Times that he was not aware of the arrest but would revert once he received information on the matter. Mr Afunanya kept his words and called us this afternoon to confirm that Mr Baba-Inna was in custody at the headquarters of his agency in Abuja. “He was handed over by the Police and investigation is ongoing,” he said. A member of the Baba-Inna family also informed us that the SSS allowed Hassana, the wife of the ADC to meet him today.